My class had its 45th reunion last week. Three of the four of us who lived together were able to be there. My oh my what a lot of visiting took place! 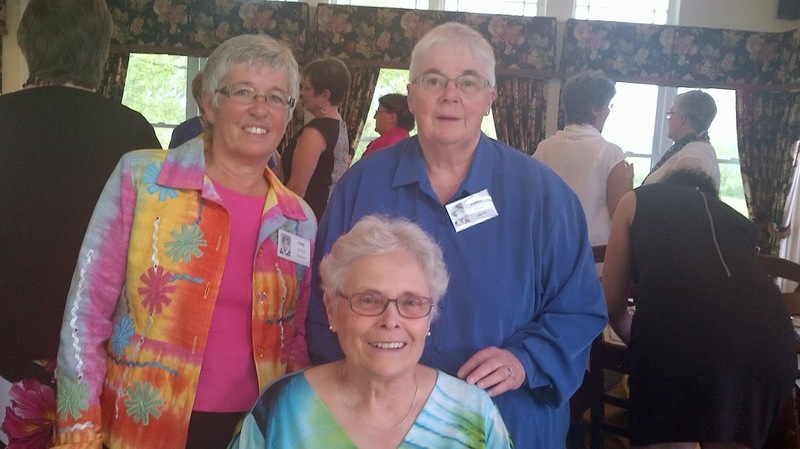 The organizers for this reunion had it take place at The Waring House in Picton, Ontario. It is a part of Ontario that I have not spent much time in. There are a huge number of things to do and see even in the "off" season. Wine tours, arts tours, cheddar and ale tours, taste tours to name a few. The Waring House also has a cooking school. I will confess I hit the road on Wednesday morning and drove to Belleville to visit Fun with Stitches a fantastic quilt shop. I helped reduce their inventory. After that I rejoined the wine tour people at their fourth stop for a delicious lunch on the patio. It was the first really lovely day for weather most of us had seen for a long time. 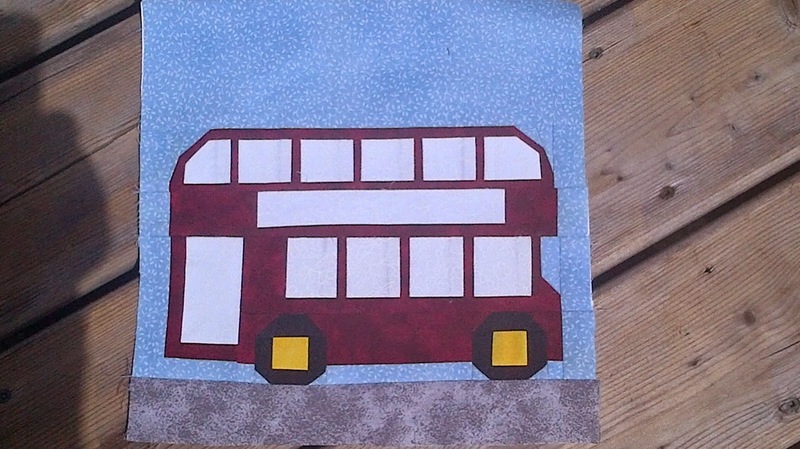 This is a charming double decker bus Kristy from Quiet Play (here) designed. She emailed her tester group about a week ago to let us know she had some blocks ready for testing. I picked the bus and it was still available. She has done a whole series with a London theme. They are out at various testers and should likely be available through her Craftsy store soon. 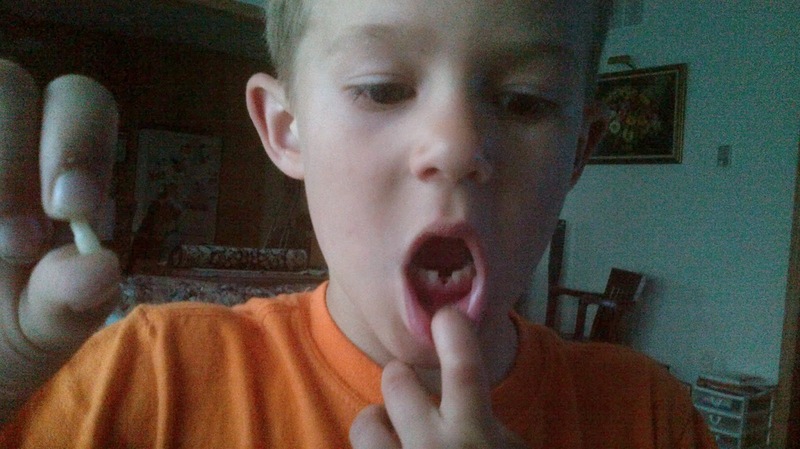 This is my second Hands to Help. It is all bound and labelled and ready to donate at the next Scrapbag Quilters meeting. It's final dimensions were 41" by 49". It was originally done as a mystery quilt using nickels. 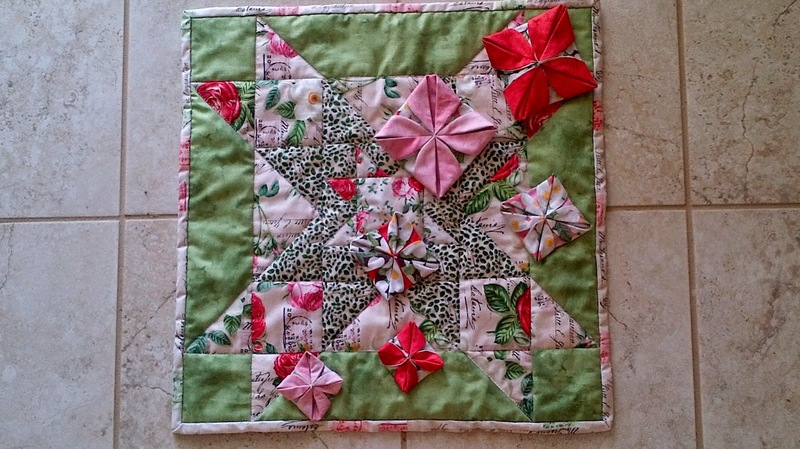 Early in April Windham Textiles had a blog post offering followers the opportunity to make a mini quilt that would finish 18" square and feature one of their new fabric releases. So I replied to their blog post and ended up with a nice sampling of their new Ava line. It is very traditional in appearance so I thought their would be a disconnect with a thoughly modern design. I went with a star in a star in a star for the background and some origami flowers falling across the background piece. I know it arrived in New Jersey on time. I hope that somehow I will get to see a picture of their booth. In other quilty news I have attended two quilt retreats since my last post. 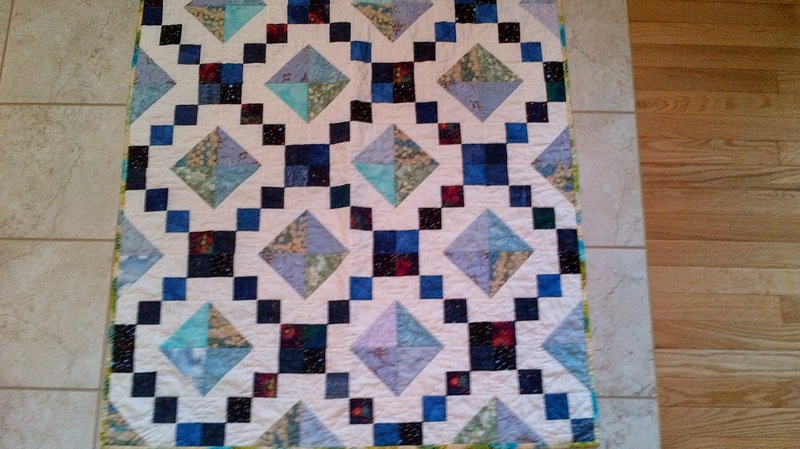 The first was in Woodstock and was with the Canadian on-line Quilters group. The hotel we stayed at had set up their well lit meeting room so that we each had lots of room to work. Everyone worked on their own projects but we did do some show and tell, and shared some mini demos. There was a near by quilt show that some attended and a marvelous shopping opportunity. All in all a great time. I went two years ago but life was too crazy at this time last year so even though I had said I would go I had to withdraw. The second retreat was with some work colleagues. Although we are hardly work colleagues anymore. This year marks our 25th year of get togethers. At first we shared teaching ideas and strategies but gradually as we retired our time together was spent quilting. Finding a window of opportunity for 7 busy women to commit to the time away can be a challenge but in the end this time we had 5 there for the entire time and one who made it for some of the time. Lots of laughs, lots of sewing, good problem solvers always available and of course great food.